Bert just loves his food. I'm so lucky that he's such a good eater, and genuinely seems to have a love for a huge variety of foods (I wonder where he gets it from??) From the very beginning of his weaning journey he's eaten a mixture of fresh homemade foods, and shop-bought baby specific foods. I'm realistic about the way we eat as a family, and know that eating fresh homemade food 100% of the time is unrealistic - sometimes we need something fast, and that is where ready made baby foods have been a godsend for us. We've tried loads of brands over the past year, and Bert hasn't rejected any - but for my own peace of mind I like to choose baby foods that come from companies I know and trust, who have high standards in terms of what goes into their foods, and can provide Bert with a large variety of interesting flavours to help him develop his culinary tastes. Heinz for baby are constantly coming up with new and exciting foods for babies, and we've been lucky enough to road test some jars from their newest range. Mum's Own range from Heinz contains over 30 different recipes, all inspired by mums' home cooked hits- for mums, by mums - including two of their latest recipes created this year: 'Carrot and Sweet Potato Mash' and 'Vegetable and Chicken Curry'. The jars are perfectly balanced nutritious meals to give your little ones when time is of the essence, but still have all the great taste of a homemade recipe. Bert's been tasting a selection of this new range, and boy does he love them! He's wolfed down every single jar with no fuss, and as a mum, I can't really ask for better than that! 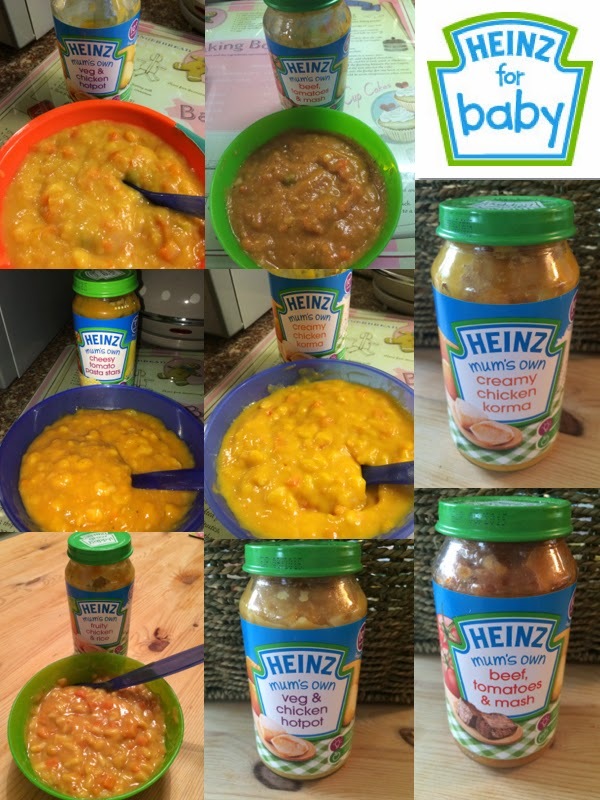 All the above jars were from the Heinz Baby 7 months + range, although Heinz Baby produces foods suitable for children aged from 4 months right up to 2 years! My cheeky boy eating his dinners with no fuss, oh, and even the cat was pleased with our delivery from Heinz, she does love a wicker hamper! The jars we've been testing: whole pieces of ingredient obvious within the food, unlike some other branded 'mush' foods we've tried which are unidentifiable. What I loved most about these jars, aside from their ease, was the fact that you can actually see and identify ingredients within the food: I could see whole peas, pieces of carrot, pasta, tomato etc within the baby food - which instantly helps alleviate any guilt I might feel about feeding him from a jar, on occasion. Other jars of food we've tried in the past have often been completely unidentifiable mush - genuinely anything could have gone into it, and I wouldn't know unless I scoured the ingredients list on the jar. The proof of the pudding really is in the eating, and the fact that Bert has eaten all of every single jar without any messing around is really all the information I need. He likes them, and for that reason alone, I'd definitely pick them up again in my food shop. "We carefully choose all our ingredients and recipes to provide your little one with lots of essential goodness, and we only use the finest baby-grade ingredients in our delicious jars. Baby-grade foods need to be completely traceable and meet far stricter guidelines than adult foods, even organic. So we grow them on one of our specially chosen farms, in suitable soil that’s away from potential contamination from pesticides, pollution and nitrates. Because quality is important to us we follow a rigorous process when making all our jars. Meat, fish, vegetables and fruit are thoroughly tested to make sure they’re safe for your little one. Then we steam-cook our meals to lock in all the precious nutrients. And because they’re steam-cooked and sealed in a jar, there’s no need for preservatives. We run no less than ten checks throughout the cooking and packing process. Finally we make another four checks on taste and texture before it goes out the door. For more information you can head over to the Heinz Baby website where they have tons of info about their products, cooking methods, weaning advice and even some great recipes for you to try cooking at home. There's been lots of happy dinner times at The Bishop household of late, thanks to Heinz - so why not give them a try with your little one and see if they love the taste as much as Bert does. 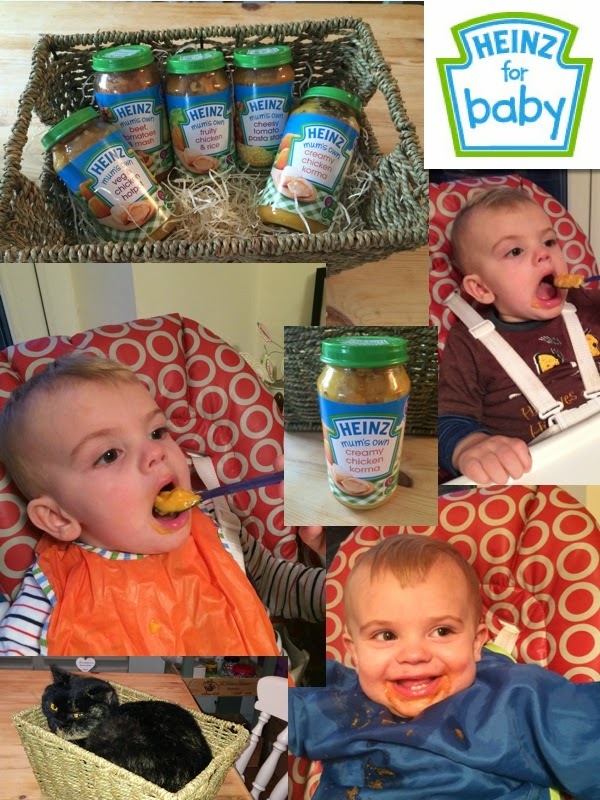 Disclaimer: I am part of the Heinz Baby Blogger Ambassador programme, and was sent a hamper of 5 jars of Mum's Own baby foods to try for the purpose of this review. All opinions, and photographs are my own.